It is obvious to all of us coaches, players, management staff that he has grown into the acknowledged leader of the Pittsburgh Penguins. It is only appropriate that he wears the “C” as team captain. RAY SHERO, Penguins general manager, commenting on the day Sidney Crosby was promoted to captain. Randy Carlyle’s 1982-83 road jersey. 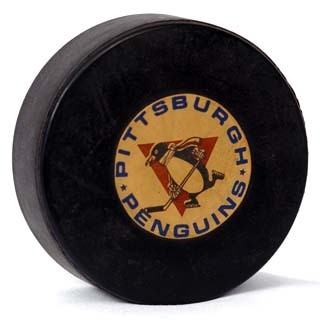 • The Penguins did not have a captain from 1970 to 1973. Three players wore the “A” for alternate captain. • The Pens did not use a captain in 2006-07. • On May 31, 2007, Sidney Crosby was named the team captain, the youngest in NHL history. *McKenna was captain on January 10, 2004 against the Montreal Canadiens for the Hockey Fights Cancer Jersey Auction.